There can be little doubt that Dunedin and southern New Zealand in general have left their mark on the World Cup with the enthusiasm of the people and a clear love of the game ensuring a welcome to rival any other host city in the country. But making an impact on the game is nothing new to this region. A rugby heartland if there ever was one, it has helped shape not only the game in New Zealand but also the rest of the world. This colourful contribution is celebrated in an exhibition entitled Ruck It! How Otago Shaped Rugby History that is currently drawing fans to the city's Hocken Library. It is here where you will learn how the modern scrum and rucking originated in Otago and formed the basis of the "uncompromising style of play" that scarred many but influenced so many more. But it is the players and coaches who carved that reputation that demand and are given pride of place. The impressive Hocken Collections archive help re-tell the story of such notable figures as Otago-born Tom Ellison who captained New Zealand against Australia in 1893 - the first team chosen under the auspices of the New Zealand Rugby Union that was only formed the year before. Ellison, who made his first international appearance for the New Zealand Native side that toured Great Britain and Australia in 1888-89, was described as 'a magnificent forward' and 'recognised as THE authority on the game in New Zealand' and would later be responsible for the idea that the national side wear a black shirt with a silver fern logo having previously been decked out in dark blue with a gold motif. Perhaps more significantly, he developed the role of the wing forward in 1892 that was superseded by the flanker position with the move to the eight-man scrum in the 1930s. His rugby knowledge and insight lived on long after his premature death in 1904 thanks to the widely-respected coaching manual he produced two years before his death - The Art of Rugby Football. But he was not alone in producing a seminal rugby text - step forward Billy Stead. Born in Invercargill, Stead was vice-captain of the 1905-06 All Blacks, the first side to tour outside Australasia, and more commonly known as the Originals. The epic tour to the British Isles, France and the United States of America was a great success - with just one defeat to Wales - and come the end of the trip, Stead and his captain Dave Gallaher were commissioned by a British publisher to put their thoughts on the game into print. The result was the The Complete Rugby Footballer that remains one of the most influential books produced in the realms of rugby literature. But the imprint left by southerners does not end there. Another Dunedinite in the form of Jimmy Duncan was the first All Blacks coach, guiding them into their first ever Test clash on home soil against Great Britain in Wellington back in 1904 - a game won 9-3. A key figure at Otago Boys' High School in the 1920s and 30s, Duncan is also credited with creating the term 'five-eight' when changes in the scrum created an extra back. As the game already featured two half-backs and three three-quarters he simply opted for the fraction between the two. The coaching world also owes a debt to the Cavanagh family. The father-and-son duo, known as Old and Young Vic, created and refined the 'rucking game' that catapulted the game to a new level and became a well-thumbed blueprint for coaches around the world. "His influence stretched far beyond his active years and celebrated British & Irish Lions coach Carwyn James is said to have immediately sought an audience with Cavanagh following his side's arrival during the celebrated 1971 tour of New Zealand." Old Vic, who steered the Otago University side to 10 club titles between 1923 and 1934, made his reputation as a master tactician with his "dynamic personality and cunning use of psychology" creating a "strong team spirit". As 'Professor of Football' to the University, he developed his famous 'loose scrum' technique that was devised to help lighter forwards win ball in broken play. Young Vic, who coached the rival Southern side after his playing career was cut short by injury, was another keen student of the game and quickly modified this technique into what became known as the 'Southern style'. With innovation came success with the Ranfurly Shield a near-constant companion throughout the 1940s and was even retained when the 1949 Otago side were stripped of their 11 All Blacks. His influence stretched far beyond his active years and celebrated British & Irish Lions coach Carwyn James is said to have immediately sought an audience with Cavanagh following his side's arrival in Dunedin during the celebrated 1971 tour of New Zealand. This ground-breaking approach to the game was further developed by another Otago representative - Charlie Saxton. A pupil of Duncan's at Otago Boys' High School, he later captained the 2nd New Zealand Expeditionary Force, or the "Kiwis", on their successful 1945-46 tour of Britain and Europe. But it was as manager of the 1967 All Blacks alongside coach and former army team-mate Fred Allen that he wielded perhaps more influence. A long line of influential coaches from Otago has since included Eric Watson, Laurie Mains, Gordon Hunter and Tony Gilbert with the latter overseeing a golden period for the region that saw them claim the national title in 1991 and 1998 and produce a record number of All Blacks - eight on seven occasions between 1999 and 2001. At one time they also had three players who had led the All Blacks - Taine Randell, Anton Oliver and Tom Willis - within the same squad. A total of 156 All Blacks have come from Otago, a feat surpassed by just three other regions - Auckland, Canterbury and Wellington - while the University club has no equal when it comes to providing New Zealand internationals. And while it is the people of Otago who have written much of the game's history, Dunedin's iconic stadium - Carisbrook - arguably commands greater respect. 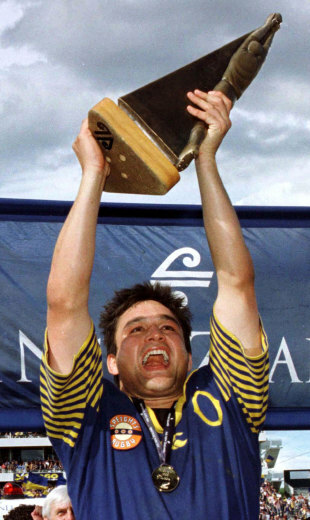 The 'House of Pain' is synonymous with Otago's no-nonsense approach to the game and has played a role to rival that of any individual in reinforcing the region's reputation. But now, after over a century of rugby, it has been replaced with a new, purpose-built venue in the form of the Forsyth Barr Stadium. Renamed the Otago Stadium for the duration of the World Cup, it may not yet have the formidable reputation of its now dated predecessor but its futuristic fully-enclosed design certainly adds to the city's reputation for innovation.